Swimming is an ancient sport that has long promoted survival, health and recreation. It skyrocketed in popularity in the early 1900s thanks to the competitions held by the National Swimming Society of Great Britain. By then, four particular strokes were already well known to most of the competitors. Cave paintings from the Stone Age depict swimmers using the breaststroke technique. Though the breaststroke is the slowest stroke used in competitive swimming, it requires considerable coordination and strength. In 1956, Japanese swimmer Masaru Furukawa won the Olympic gold medal in the event by staying largely underwater. When swimmers who adapted his technique began passing out due to a lack of oxygen, new regulations had to be set in place requiring that swimmers break for air after each complete stroke cycle. Numerous swimmers contributed to the butterfly, which was derived from the breaststroke. American coach David Ambruster used underwater photography to analyze the breaststroke to help show bringing the arms out of the water increased its speed. By 1938, the stroke was used by most competitive breaststroke swimmers according to the Halton Swimming Club. Though the technique was eventually banned during breaststroke competitions, it was officially recognized as new stroke in 1953. It was first used in the Olympics during the 1956 games in Melbourne, Australia. Also known as the Australian crawl or Trudgen stroke, the front crawl originated in South America. Englishman John Trudgen copied it after observing some South Americans swimming. He introduced it to England in 1873. 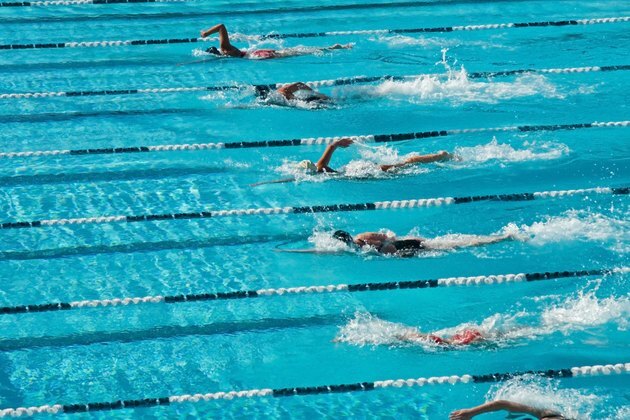 The stroke is often called freestyle because, as the fastest stroke, it's almost always used in freestyle competitions. The front crawl is also sometimes credited to Australian Richard Cavill, who refined it to its modern day incarnation. Freestyle swimming events were introduced to the Olympic Games in 1896. That encouraged swimmers to experiment with variations of the breaststroke and the front crawl. The backstroke developed from the front crawl, as it is essentially an upside down version of the stroke. The first backstroke competition was introduced in 1900. Unlike other competitive strokes, the backstroke starts with the swimmer pushing off the wall rather than diving into the pool. Australian swimmers later changed the look of the backstroke by bending their arms slightly rather than keeping them straight.